Linda Kerley of the Zoological Society of London, runs a camera trap project in Russia, where they hope to snap pictures of endangered tigers. What researchers found on a recent trip however was far more rare. Dr. Kerley was initially puzzled when she found deer remains near the trap. The surrounding snow showed no tracks from a large predator like a tiger or bear. Everything was cleared up however after Dr. Kerley returned to camp and reviewed the pictures, saying "I couldn't believe what I was seeing." Scientists involved in the project stress that eagles do not regularly attack deer and this is not a regular occurrence. 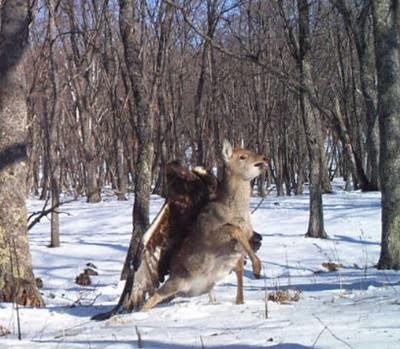 In fact Dr. Kerley says, "I've been assessing deer causes of death in Russia for 18 years—this is the first time I've seen anything like this." While they don't regularly attack large mammals eagles have been known to make attempts at everything from coyotes and deer to beer cubs. You can find more information on this story at the WCS Website as well as learn how you can assist in wildlife conservation. 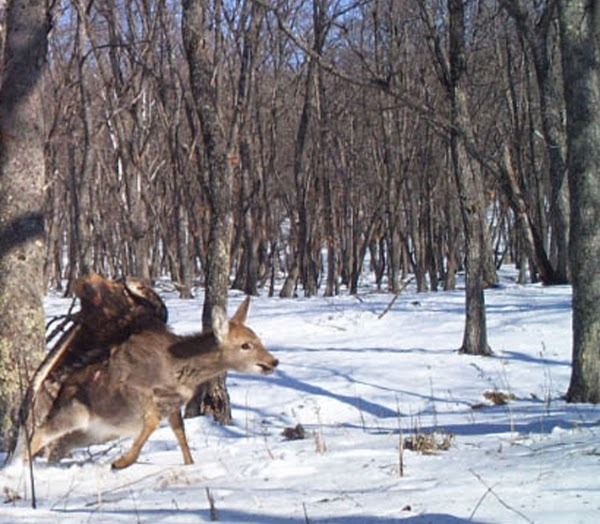 Golden Eagle Catches Deer On Camera, Woah this looks so wild man and creepy too. How did you manage to take a perfect photo of this incident?